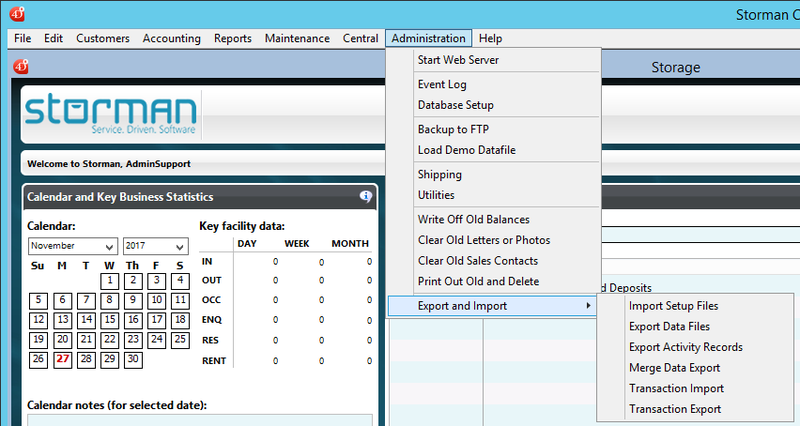 Below is a before and after screen shot of the File menu. 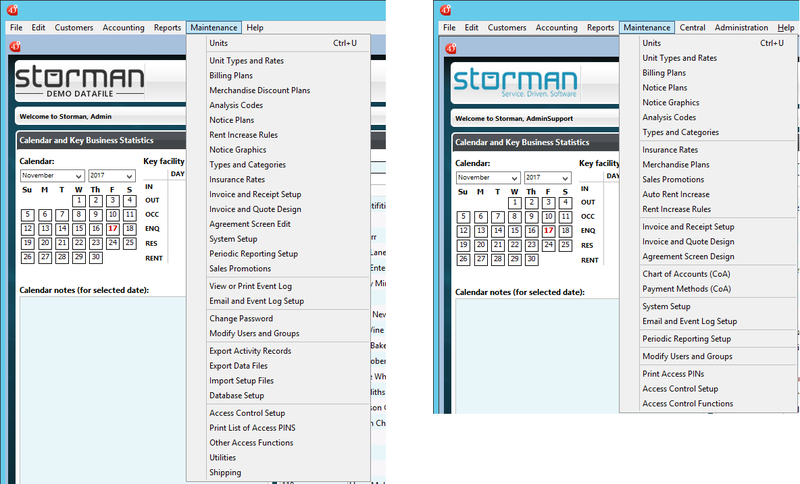 has been changed to "Go to www.storman.com"
has been changed to "Update licence details"
has been changed to "Check for updates"
has been changed to "Go to current release notes"
Below is a before and after screen shot of the Customers menu. 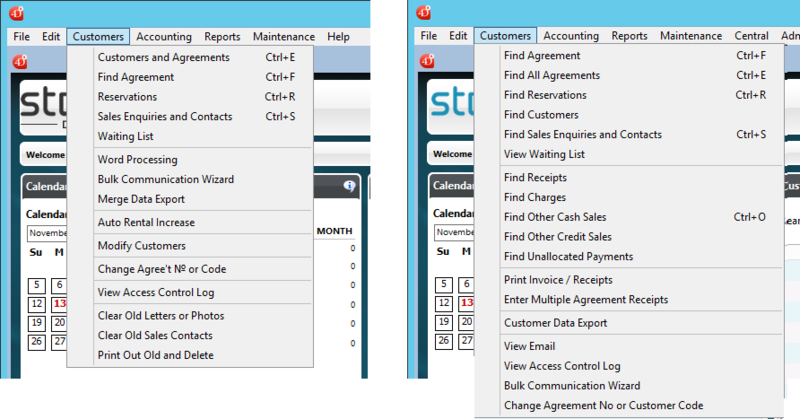 has been renamed to "Find Agreements"
has been renamed to "Find Reservations"
has been renamed to "Find Sales Enquiries and Contacts"
has been renamed to "View Waiting List"
has been renamed to "Find Customers"
has been renamed to "Change Agreement No or Customer Code"
Below is a before and after screen shot of the Maintenance menu. 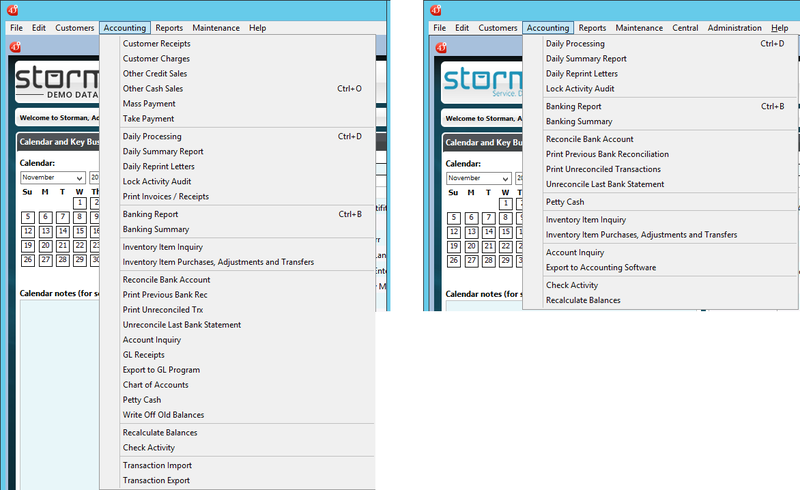 has been moved to the Customers menu and renamed "Enter Multiple Agreement Receipts"
has been renamed to "Print Previous Bank Reconciliation"
has been renamed to "Print Unreconciled Transactions"
has been renamed to "Export to Accounting Software"
Below is a before and after screen shot of the Maintenance menu..
has been renamed to "Merchandise Plans"
has been renamed to "Agreement Screen Design"
has been renamed to "Access Control Functions"
has been renamed to "Print Access PINs"
has been moved to the Maintenance menu from the Customers menu, previously called "Chart of Accounts"
has been moved to the Maintenance menu from the Customers menu, previously called "GL Receipts"
Below is a screenshot of the new Administration menu.